Pokemon Moves: Thunder Shock, Tackle, Tail whip, Scratch. Personality: She is ussualy very kind and naive, But when it comes to getting somehting she wants or fighting for something she beilieves in, Shes hard headed energetic and does WHATEVER she needs to do to win. Background: She was born and raised on a reasonably sized island named Costa-Luna, It was big enough for a castle and a village. The village wasnt very hi-tech. 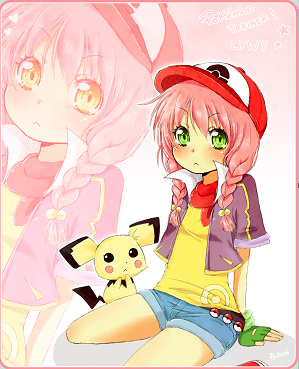 She was the princess of Costa-Luna, On her 5th Bday she got a pickachu as a present from her mother. But when a man and his island country tried to take over she fled the small island country of costa-luna at the age of 8. She was raised by a woman who had helped her ecscape, The woman lived in the region of Unova. Princess Lotte lived with her from then on.